I don’t think it’s any secret that I subscribe to an Augustinian understanding of how we approach and comprehend Holy Scripture’s message to God’s people. Commonly known as “faith seeking understanding” (from the Latin fides quarens intellectum), this view says that we come to the Bible and understand its message not as blank slates, without presuppositions and with complete objectivity, but in faith. Those who read Scripture with the eyes of faith in Christ Jesus most fully comprehend what it is saying. Or, to put a finer point on it, only those who read in faith can fully understand its message. When I espouse this epistemological approach to comprehending Scripture, I am usually asked the same question: “But what about unbelieving biblical scholars/readers from whom I (or we in the discipline) gain knowledge about the Bible’s message?” While I understand the impetus behind that question, I also think it arises from a misunderstanding about the Bible’s ultimate purpose. The Bible, as an historical document, has a series of messages written by specific people at a specific time and for a specific audience – it is in one sense, therefore, for information. But the Bible is not just for information; it is for transformation as well. Again, this aspect has an historical aspect to it, one that is particular to each book contained within the biblical canon, but the Bible’s ultimate transformative purpose, as a covenant document inspired by God the Holy Spirit, is to point to the consummate revelation of the Triune God, Jesus Christ, the incarnate person of God the Son, so that we might know him and be transformed into his image, and, through this transformative knowledge, know and love God the Father. In other words, the ultimate purpose of the one Bible, in all of its diverse parts, is to help us know God and love him. Only those who have confessed Christ as Lord by the power of his Spirit to the glory of his Father can do that. Along these lines, I have just finished Matthew R. Crawford’s fine monograph, Cyril of Alexandria’s Trinitarian Theology of Scripture (Oxford: OUP, 2015; I’d recommend that you drop what you’re doing and read it now – it’s brilliant). In it Crawford notes (see esp. pp. 184-205) that Cyril also held to this view of biblical interpretation, and dealt with the question of how both believers and unbelievers can in some sense understand the Bible. According to Crawford, Cyril used John 1 and John 9, both instances in which Jesus is referred to as light, to distinguish between two types of illumination. The first, what Crawford calls “creative illumination,” is given to all humanity and is a function of all of creation’s participation in God, and particularly in the Son’s wisdom. (“Participation” here is not salvific, but only intended to communicate that anything that exists only exists because it is created and therefore participating in the one life-giving essence, the Triune God.) The Son is Light, and all of creation as creation necessarily lives in that light. They may reject the light, but that does not vanquish, extinguish, or turn off the light. Crawford glosses Cyril’s thoughts on this type of illumination by referring to it as “generic rationality.” As image-bearing creatures, human beings are capable of basic reasoning, and therefore of understanding Scripture in its historical sense. In other words, because human beings can reason logically and utilize the tools of historical research, the whole Bible is to one degree understandable to all people. But there is another type of rationality according to Cyril, a pneumatic, or spiritual rationality, that is only afforded to those who have confessed Christ and been renewed by his Spirit. It is this “redemptive illumination” (Crawford’s term) that allows readers to not only comprehend the details of individual passages and books but to see read them in light of their divine intention. By the help of the inspiring and now illuminating Spirit the Scriptures show readers Christ, and thereby they transform them into his image and make known to them the Father. There is, in other words, a creative illumination that is common to all humanity by virtue of their participation in the Son’s Light, and there is a redemptive illumination that is only given to those who have confessed Christ and received his Spirit. When we read the Bible, therefore, those who read it with us, believing and unbelieving, can come alongside and assist us in our understanding of its historical sense. But only those who confess that Jesus is Lord and receive his Spirit through repentance and faith can see him, know him, be made like him, and through him know and love the Father, when reading his Spirit-inspired Word. I’m really excited that another resource has come out from my friend Heath Thomas. Heath is Associate Professor of Old Testament and PhD Director at Southeastern Seminary in Wake Forest, NC. 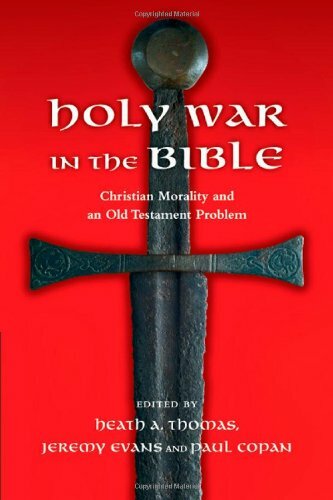 His latest publication is an edited volume (along with Jeremy Evans of Southeastern and Paul Copan of Palm Beach Atlantic University) on Holy War in the Bible. I’m sure this will be a welcomed resource on an important theological and ethical topic. You can order the book here. I’m thankful for STR for conducting a round table discussion concerning some of the brouhaha around Licona’s interpretation of Matthew 27. I won’t get into my own personal feelings of how this situation unfolded. You can read the dialogue here and decide for yourself.